Two islands and eight dives into the Phoenix Islands Protected Area (PIPA), and we have now located the pulse of the reefs. Now we can assess their health at heart: i.e., if and when they might fully regenerate to their legendary pre-2002 splendor. Today we dove both lee and windward sides of McKean Island, and also near a large shipwreck in huge chunks, like the beach scene from "Planet of the Apes." Before we jumped in, Greg Stone warned that this had, on an earlier visit, been a place with particularly numerous and aggressive grey reef shark. Upon rolling into the sea on the lee side of the island we were met by one good gray, keeping the faith, apparently, but lonely and curious more than fearsome. When it seemed okay to look away from the shark, our eyes were met with a heavily grazed hardscrabble surface with scattered live corals, some beset with filamentous algae and cyanobacteria: a eutrophic (nutrient rich) site way out here in a highly oligotrophic (nutrient poor) ocean. The hordes of birds screaming overhead may have had something to do with this, and indeed, one of our dive sites was opposite the ruins of a guano plant that once operated here. There was little evidence that the coral had been more extensive recently, but the combination of caves, pavements, boulders, fissures, sand and rubble made for high habitat diversity and an interesting assortment of fishes. It also made for a difficult set of transects, and our normally highly organized and efficient coral and fish teams had to wind around among the outcrops, each other and the photographic team in a scene that must have thrilled the fishes no end. The commotion flushed an enormous marbled sting ray out from beneath one of the big overhangs, and just in time--our bevy of photographers took off in blue pursuit out into the sand plain, leaving behind a more peaceable kingdom for us to reduce to numbers scribbled on slates. Our windward dives brought revelation. Nearing the bottom at about 50 feet, we found a vista of giant overlapping pink disks up to about two meters in diameter and two or three thick, shingling the slope down into the depths. Springing from the tops and sides of the disks were young corals; mostly Pocillopora spp., but many others as well. The place was a crime scene, the piles of pink disks the victims, and the warm water in whose embrace we swam comfortably about, the perp. Obviously this reef had been dominated by the tabulate (shaped like a coffee table) coral Acropora hyacinthus, but all were now dead, bleached and killed, most likely in the severe heating event that baked central Kiribati's reefs in August, 2002. The pink casement about each table top was crustose coralline algae--a sign of healthy populations of herbivorous fishes, and a desirable surface for the resettlement of a new generation of corals. 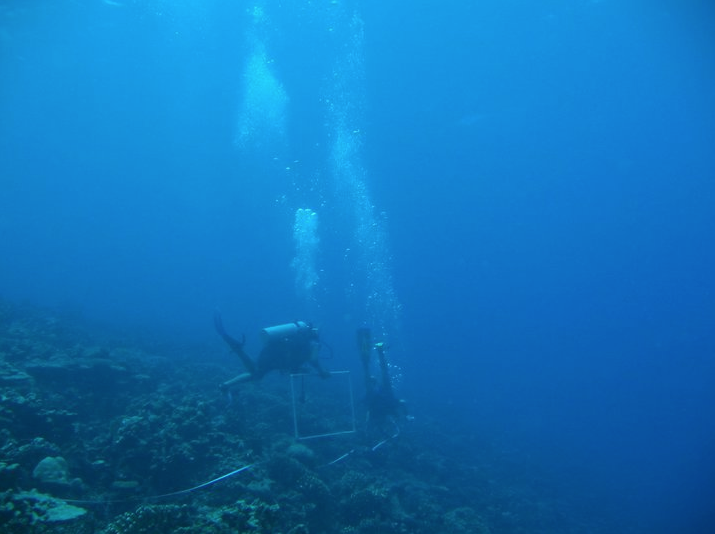 Indeed, we were enveloped in clouds of big parrotfishes and surgeonfishes, the impacts of thousands of enameled jaws on the reef's limestone framework clearly audible to the aware listener as a grinding din. Along with the parrots and surgeons were good numbers of big snapper and grouper, another good sign. Taking all this in and writing it down was a not a trivial exercise. My serial nubbin pencil had gotten itself into a jam, and the fish were streaming by our faces faster than I could distill them into graphite glyphs. Stuart Sandin and I face-danced with our eyes to communicate who had "gotten" which fish on their side of the transect line to avoid double-counting. All the while, an intermittent rain of coral sand fell from the clouds of parrots passing overhead. Looking about, we had our fill of eye-candy: butterflyfishes and angelfishes, many species highly dependent upon living coral for food, evidently having found enough of it to hold their own on this reef still in its early stages of resurrection. All of this was wonderful, of course, but we are haunted by what we did not see on these dives. The baby corals springing up on the big pink coins were of different species than had previously carpeted this reef. Where were the baby tabletops? 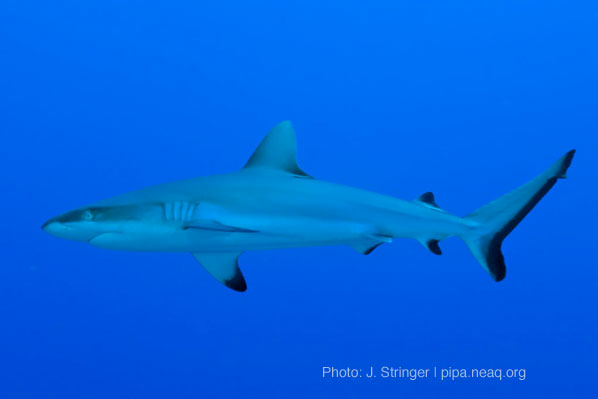 A few sharks had slipped by, and Birgett--one of our divemasters--had seen one scalloped hammerhead deeper down. Where were the hordes of sharks for which these islands are famed? We'll have 24 hours to contemplate these and other mysteries as we set out on our next passage, to Kanton--the only inhabited island in the Phoenix Islands Protected Area. Before leaving Fiji, I was tasked with the acquisition of several kilograms of fine quality kava roots (yaqona, pronounced "yangona," a bushy member of the genus Piper), wrapped in cerimonial style, as waka, for the traditional welcoming ceremony of sevusevu. Kava is prepared by pounding the roots into a powder and part-dissolving, part-suspending the result in water in a communal bowl on legs, called a tanoa. The presentation of kava is the civil thing to do when intruding upon the peace of another village or household. It is reasonable to presume that after the formalities, it will be party time for the denizens of this distant island outpost, and for the crew of our expedition! This journey is certainly not without extreme adventure, excellent company and exhilarating fun. Balancing all that adrenaline with the intense focus, deep contemplation, tediously repetitive tasks and not inconsiderable risks attendant to our coming all this way, is itself more an art than a science. Me, I am hideously behind in the transcription of my eight dives' notes on species abundance, diversity, natural history and geology, so off to the books I go. I'm disheartened to read that you're not finding too many signs of Acropora recovery. How does the Kanton lagoon look? Enjoy your time on Kanton-especially the incredible people. Living vicariously through your adventures.